At CRC we now only use a 2mm needling device for every treatment as research has shown that greater results are achieved when penetrating to this depth. We further intensify the skin needling treatment by applying topical agents that contain active ingredients such growth factors, peptides and/or hyaluronic acid to the treated area post needling. These ingredients are responsible for the up-regulation of collagen and elastin production in the skin. Furthermore, by applying these topical agents immediately post skin needling they allow for 40 times greater uptake of these active ingredients deep into the skin, further enhancing the overall treatment outcome. 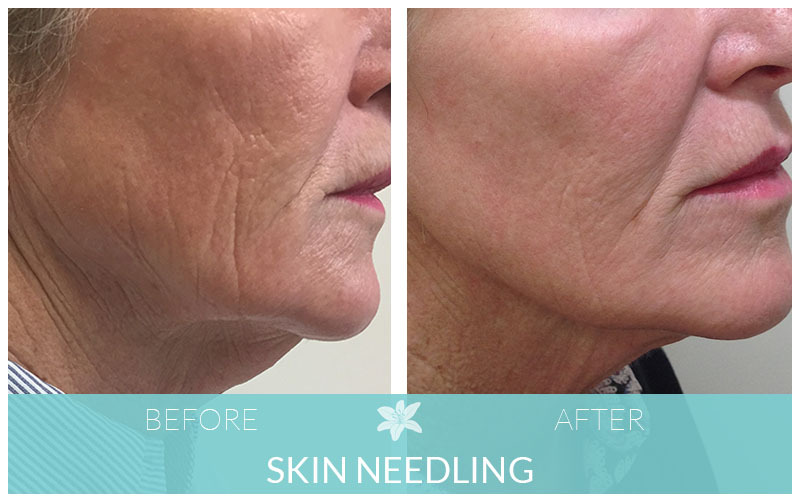 Skin Needling improves blood supply, breaks up scar tissue, and encourages healthy new skin formation. The skin improves in quality and thickness through the regeneration of elastin and collagen. The collagen production continues for up to 12 months after the procedure. Depressed acne scars, wrinkles, skin texture and tightness are all improved as a result. This method is also used to improve and blend pigmentation irregularities. These were the results of just one skin needling treatment using a 2mm device. To maximise the overall treatment outcome, this client prepped her skin using the Tensage Biorepair SCA 15 serum (which contains growth factors) in the morning and the Tensage Stem Cell cream in the evening for two to three weeks leading up to the treatment. We also re-introduced these products again to her skin 48 hours post treatment. Downtime: 2 days, no pain discomfort just the feeling of sunburnt skin post treatment. Mineral makeup coverable after 24-36 hours. The treatment itself, a post treatment kit that the client will use for the first three to four days post treatment as well as all necessary review appointments. Book an appointment with Chelsea today! Our state-of-the-art electronic device allows fine control over needle depth, and this can be tailored to your individual treatment plan and skin requirements. Local anaesthetic creams are used to numb the skin prior to treatment, and following treatment, the skin will be left with some redness, a little like sunburn, that will last 12 to 24 hours on average. We recommend the use of sunscreen to help protect your skin in addition to a medical skincare regime to encourage and accelerate healing. You will need to allow 2hrs for this medical depth procedure. Only qualified dermal clinicians can perform this treatment in our clinic. Treatments are usually four to six weeks apart, depending on your individualised treatment plan. This procedure can be complemented by the use of a home roller. The cost skin needling treatments include a full post care treatment kit and all follow-up review appointments.